Were you ever a Girl Scout or a Girl Scout leader? I was a Girl Scout for about six months back when I was in grammar school. I can remember only one thing from that time – eating raw potatoes, something I haven’t done since. Our project that day was to make hand puppets, cutting out heads from potatoes. As the potato dried it would make any face look old and crinkly, a good reason why we all carved out witches. I have no recollection of whether or not I finished the project, but I still remember how those raw potatoes tasted. My Girl Scouts started as Brownies. Here they're marching in a local Memorial Day parade. When my daughter became a Girl Scout, most of the mothers in the area had jobs and few had time to be a leader. I no longer had to work after the first ten years of my marriage, so I was free to take over about fifteen girls for five years. I could write a book! Those girls provided some of the best and worst times I ever had with teenagers. We went marching, camping, recycling and canoeing, as well as demonstrating how to handle fire for the Firemen’s special day in September. What’s the proper way to light a candle? How do you stop a fire on top of the stove? What do you do if you’re clothes are on fire? I often wonder if anyone ever had to use that lifesaving information. The west from a New Jersey girl's perspective. For our largest project, each girl created a design representing the west that was transferred into a rug pattern. The girls hooked their rugs and their sections were put together to create a completed rug. Each girl threw her name into a hat, one person received the rug, and the rest got one of the pictures. They did a fantastic job. I wish I had won the rug! No, I don't eat all of them myself! Now my granddaughter is an avid Girl Scout. When GS cookies come out, I’m probably the first one on her list. But she doesn’t stop with me. Everyone gets a call, and she also sells them with her troop at different grocery stores. She really puts all her artistic talants to work. 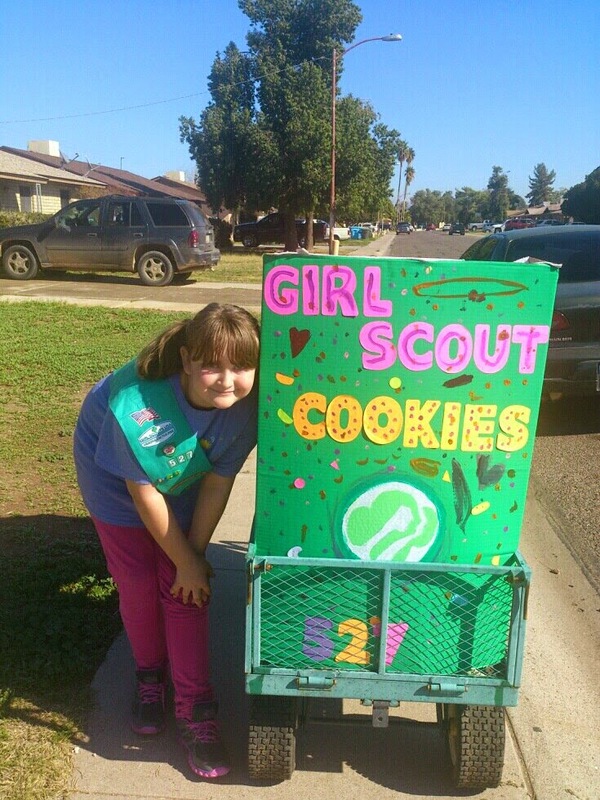 A true entrepreneur, my granddaughter's out there in front of her house with her sign, selling to all the neighbors. How about you? Have you found your experiences with being a leader or a member of a troop excellent fodder for your writing? I was never a Girl Scout, nor was my daughter (who'd have been a good one--she became a Cub Scout leader). I do like raw potatoes, though! :-) I'll bet you did get some experiences as a leader! I had some wonderful experiences. Each girl had a distinct personality. I like GS cookies and I eat way too many thanks to my granddaughter. I think I was a Brownie Scout for a while. Never was a leader, though. But I've bought my share of GS cookies! Does that count? Yes, you provided needed support. Haven't met anyone yet who didn't like GS cookies. Marion, I desperately wanted to be a girl scout! In grade school, the girls would come to school in their uniforms sometimes with that sash and all those badges... Oh, I was envious. Although now I realize with all the camping, fishing, hiking, etc. my dad did with us kids, we kind of had our own troop. But it's generous people like you who keep that wonderful organization so strong! We were fortunate to have many women in town who worked together to provide leadership. Also, the programs provided courses in canoeing and camping that were often great fun for the women. I never got to be a Girl Scout, but I love all that they get to learn. And I love the fact that they've come out with gluten free cookies! I ordered the gluten free cookies but never got any because they were new and sold out quickly. Maybe next year. Marion, I don't know that my small town had girl scouts when I was growing up. But we had huge gardens and I liked raw potatoes with salt on them. I used to eat salt on everything. Then my oldest daughter when she came along was in Campfire Girls. They were big in our area. I always worked full time so was never a leader. But I helped with many a craft project. And I like thin mint girl scout cookies. I start looking for stores where scouts go to sell them out front when I hear it's cookie time. I have to not buy too many. My favorite thing is to put them in the freezer and eat them cold. You were a good doobie to work with those girls for so many years. I bet if you asked any of them, they'd remember a good time in their lives. After my potato eating binge, I never tried them again because someone told me they’d make me sick. I never knew people could eat them that way and live to tell about it. You sainted woman, Marion! I was never a Girl Scout or a leader, but have been an avid cookie consumer. Love your parade photo with the flags - looks so Americana. Congratulations on spending five years mentoring 15 teenage girls! I don't think I'd have had the patience. The Today Show this morning was about cookies being available. There were many times when my patience became very thin. On one camping trip, I had two girls who were whiny and infuriating and wanted to go home. Then they had the audacity to ask me to nominate them for some super camper award (I didn’t). I was very happy to take them home early the next day, and they complained about that because I was cutting their great time short. Some times you just can't win. 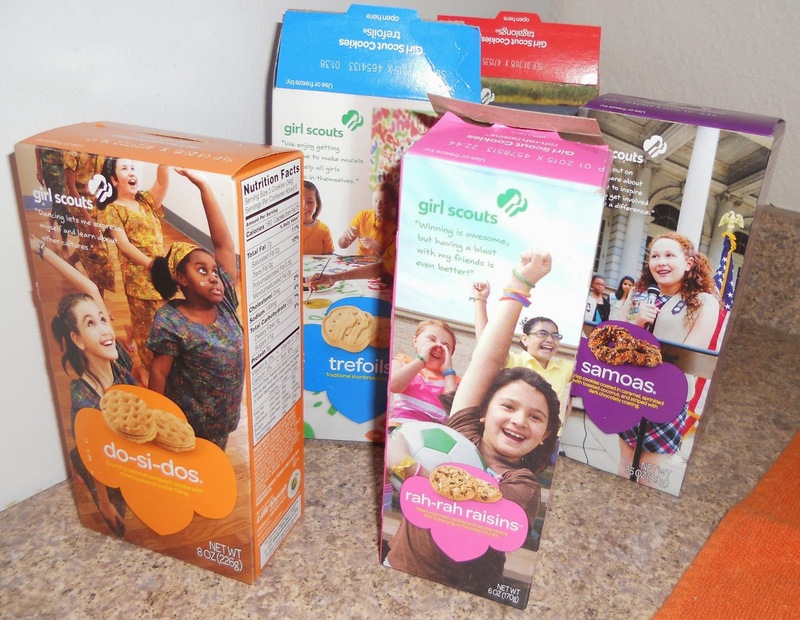 I've never been a Girl Scout, but I've purchased my share of cookies over the years. Love your photos -- thanks for sharing! I can’t believe so many people who made comments were never in the Scouts. I wish I had more photos. The one of the Brownies marching was taken in front of my house. Okay, now I'm on alert--will be stalking Walmart's front entrance for cookies. I'm addicted to Samoas. I never had daughters--two sons instead but I was a Cub Scout den mother for a while. That's enough to cause gray hairs! Our meetings at my house tended to get out of control. I was a Girl Scout for a while and loved being one. Went on a troop camping trip once and insisted on bringing meat for my supper, which took forever to cook over an open fire. Also knocked my head on a log bunk bed that raised quite a knot on my skull. I don't think I was a very good Scout . I admire you immensely, Marion. That was quite an experience. I also spent two years as a Cub Scout leader. Most of the time, though, my son was so disruptive he spent our meeting times in his room. Eventually he straightened out and went on to get his Eagle. There are many organizations out there besides the Scouts, although I never heard of the Blue Birds. While I was growing up, I participated in 4-H. It was more active than the Scouts in my town and both the boys and girls went to the same camp. 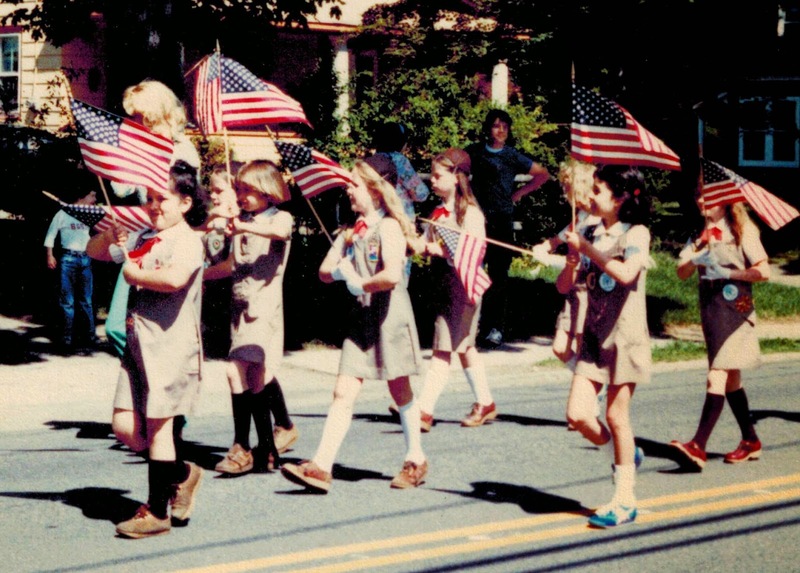 Marion, your blog brought back fond memories I have of being both a Brownie and a Girl Scout. Don't remember any raw potato projects, though. A favorite activity of mine was embroidering pillow cases. 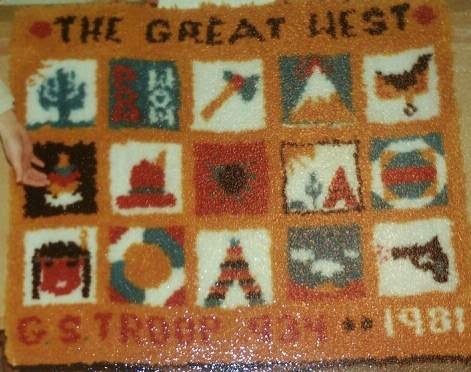 Except for the rug, my Scouts never got involved in needlework. I did love the camping, though. Eventually, I’d drive everyone to our destination and the girls did everything – setting up tents, making the fire and cooking the food – while I sat in a lounge chair and relaxed. Some wonderful memories.